What is Loose Leaf Tea all about? Expert tea drinkers are switching to Loose Leaf Tea as an alternative for tea bags as many people are beginning to take note of the benefits of drinking loose tea. Loose Leaf tea (tea not brewed in a teabag) comes from a process of infusing tea so that the leaves have proper room to absorb moisture and release nutrients. This is different than using a tea bag where unfavorable parts of the leaves are stuffed into the teabag to fill it. With tea growing in popularity (The size of the U.S. Tea industry in 2016 was $12 Billion!) it is important to make informed decisions on how to properly consume our tea. 1. Tea makers have tried to adapt their tea to fit their tea bags. This has decreased the quality of tea as they fill the empty space with inferior parts of tea leaves called "dust." This "dust" contains broken tea leaves that adds little to nothing to the cup of tea. 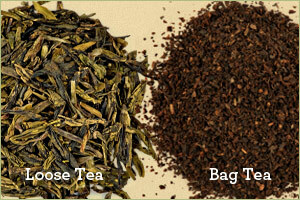 Organic Loose Leaf tea is purely tea leaves with no waste particles inside that. You know what you are getting. 2. "Tea bags are part of an intrusive chemical process." This is true, as it is widely known that many tea producers use bleach to treat their tea bags. Part of the chemical process includes the bags being dipped into chlorine- a toxic chemical. When you heat the bag, these chemicals are released and consumed by you. 3. Steeping your tea properly allows you to use a batch of leaves 5-6 times before they go bitter. Certain Oolong teas can be re-infused up to 12 times! Much cheaper than using a tea bag one time then throwing it out, with more flavor. How can you go wrong? 4. If you like quality, you will love loose tea. Loose tea is brewed so that it has room to expand as it steeps-providing maximum flavor. 5. Using Loose Tea allows for the maximum amount of nutrients and antioxidants to be released. Steeping your tea without a bag allows for more polyphenols such as flavonoids and catechins to be released. These are antioxidants that can help prevent disease and offer a number of subsequent health benefits. Tea is notably one of the healthiest beverages on planet earth. It's a shame most people do not get to reap the full benefits of repeated tea consumption. For all of my tea purposes, I only drink 100% organic tea. We have a full selection of tea equipment and a large selection of over 40 Organic Loose Leaf teas on our site with their health benefits listed. Get drinking!